Surely you have a lot of expendable players to bump your transfer budget up if you sell them? 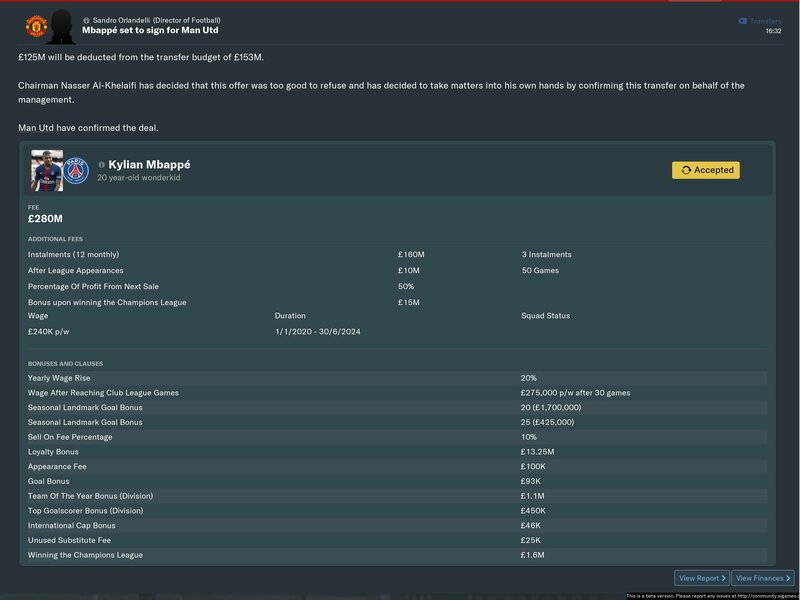 Or if you let players go out of contract, you can transfer the excess wages to your transfer budget? the problem is if i have to sell player i need time.& may not be success. & if i want to sign Sergej Milinković-Savić & Eric Dier,i need do its quick. Start the signing process now, you can always delay confirmation until you offload someone. Hope you post screenshots of your formation because I've seen a few videos you've posted in various threads scoring some pretty decent goals. Signs Savic, he's a beast and Lindelöf starts the game with "plays the ball out of defence" and can be moulded into a very good BPD and can also play at right back. its not my tactic,i saw the video & i just make its to gif. its my mistake,i should sign both Tieney & de ligt in 1st season.& Chelsea got them both in my save. i will play a new safe after 2nd Nov.
for now i want to test Eric Dier. Really enjoying my first venture on the BETA with Utd this year. Normally stay away. Started well in the transfer market and brought in a few players and made a few changes. In came Cutrone from Milan, Cordoso from Boavista, Paqueta from Fluminense, Milenkovic from Fiorentina, Vagnoman from Hamburg and A Gomez from Boca Jnrs. Sold Young and Darmian, whilst Fellaini, Valencia and Romero all headed out on loan. Started to develop a 4-2-2-2 formation that wasn't quite working. I eventually went with 3 at the back, 2 wing backs 2 central midfielders, 2 attacking midfielders and a lone striker. Since changing to that I haven't lost a game. Safe to say I have been surprised by some of the players also. I was struggling at right wing back with Dalot injured ane Laird not ready to start in the first team so I dropped Lingard into the position and he's kept that place ever since. Same with Rashford at left wing back after Shaw came off injured. Both on Wing Back attack instructions they hug the touchline making darting runs whipping the ball in for either Cutrone or Lukaku up top. I seem to be able to score freely with my very attacking gegenpress set up. A Gomez from Boca ? 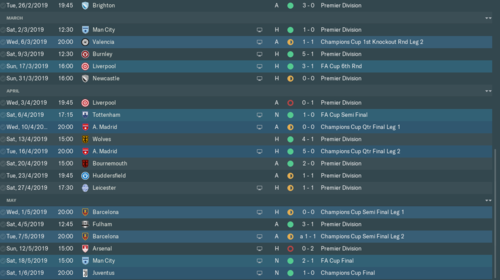 First season I won the Premier League and FA Cup and got eliminated in the qtr final of champions league, I should have progressed having had a 2-0 advantage in the second leg but FM gave me two red cards. In the first season martial, rashford and dolberg struggled as lone strikers scoring 8,6,3 respectively all my goals came from my inside forwards and pogba by the bucket load. 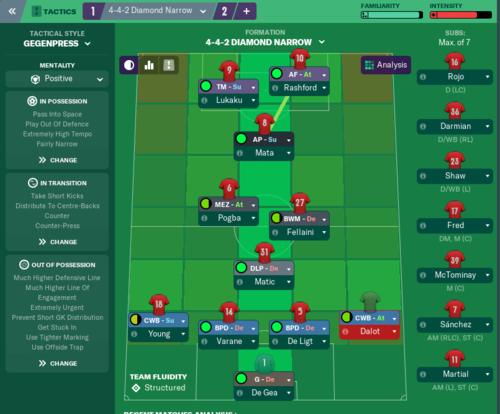 During the first season and continuing this season I have set both martial and rashford to be training as advanced forwards which seems to have produced some results. Martial is 9 for 9 so far, Rashford is 2(3) with 3 and dolberg 1(6) with 2. Martial is rated highly in terms of PA. 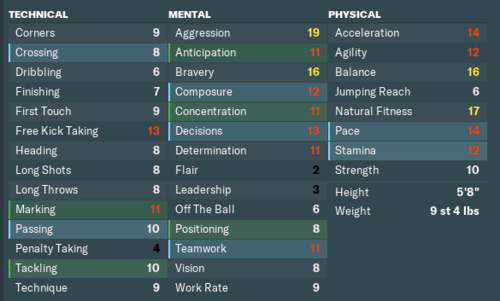 Sadly Rashford is a 3/3.5 star player and dolberg is no where near what he was in Fm 18. Augustin Gomex a 15yr old GK at the start of the game. rated highly by my scouts. As for lone strikers I play either lukaku or Cutrone. Lukaku has 4 goals in 6 starts and Cutrone 8 goals in 9 starts. Savic is an absolute beast. Thanks for reply.....interesting that you mentioned Belotti...he was great for me on FM18 and I bought him straight away for my FM19 beta testing.....neither he nor morata seemed to do well as lone striker re goals or average rating.........Must be "my tactic"! Have played around with the beta and enjoying live so far. 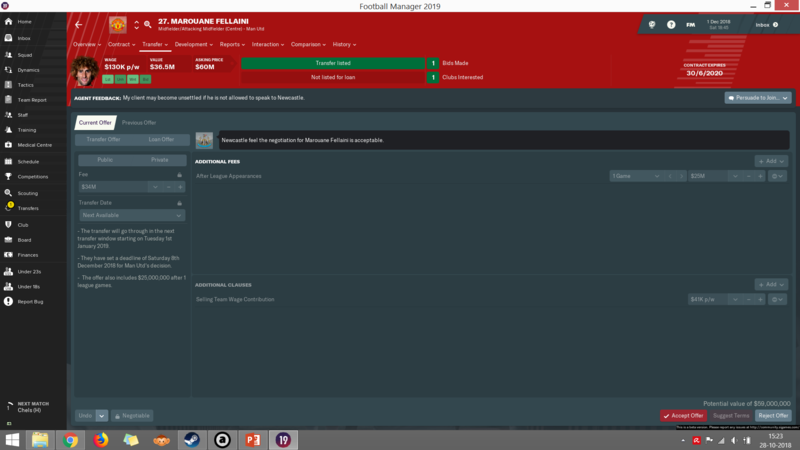 Signed Bergkamp as Assistant - not because he's that good, but because he's Dutch, just like me. Will restart when the full game comes out of course, so more detailled updates will follow from then on. It took me awhile as i was trying to find the lowest amount they would go with...........and it's absolutely insanely extortionate. Lol, United defenders are overrated. Smalling and Bailly are beasts; Jones makes howlers often, though. Rojo, I find, is fairly steady, however. 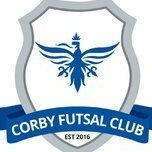 @Jamie Cortez did someone at PSG completely lose their mental faculties when they accepted 50% profit on the next sale of a £280m player? 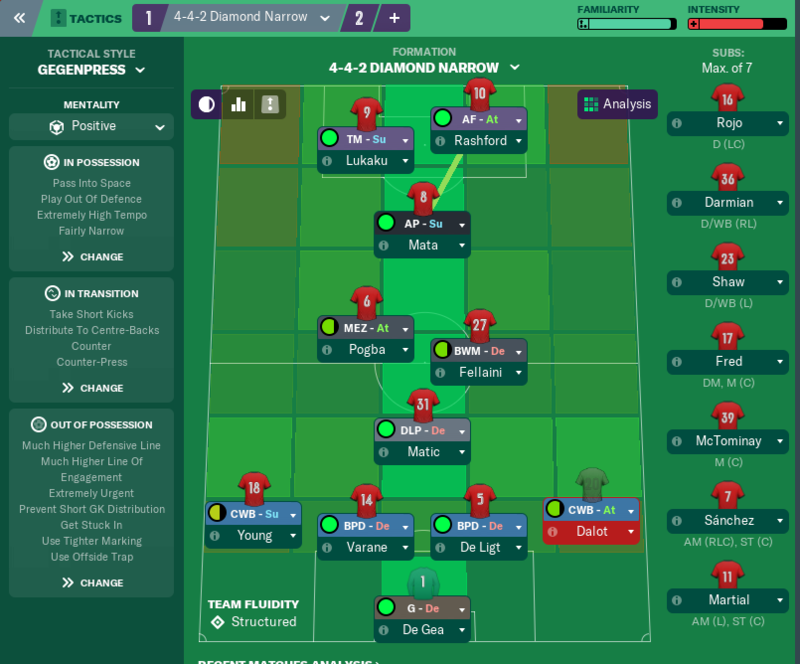 Just messing around right now, I have never played Wingers on FM, I just think its overpowered and I always enjoyed the narrow formations. My CWB's are still too over powered and whip in way too many crosses per game. Will probably win the league this season, but I am not confidant on the UCL, as we are abit dodgy away from home and I think that will cost me this season there. Lost disappointingly to Chelsea away 2-0, not too bothered about the 1-0 loss to Madrid as I have them at home next and will get my revenge. Burnley knocked me out of the Carabao and I struggled to beat them the game after that in the league, they are very organised. My last game last night I lost to Newcastle 1-0 and I was fuming, Rashford and Mata dropping 6.3's. 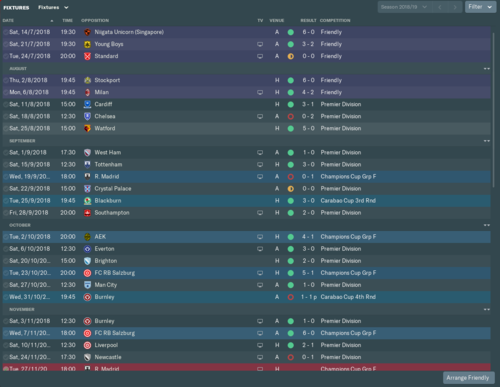 My current tactic, I tinker with a few things for away games. I switch Pogba from a B2B/Mez and I swap out Lukaku for Sanchez and play Sanchez as a Pressing Forward. Martial currently going to waste so I will probably get rid of him in the summer for big money. Mctominay has been so good for me as a B2B midfielder. Bought in Varane and De Ligt, forming a great partnership and I draft Baily in when Varane gets injured, which seems to be alot. Got rid of Lingard and got 200k a month off Milan for Perriera. We should get some more funds in Jan trabsfer window, I want Ruben Neves from Wolves and Savic from Lazio, I wont get them both this season unfortunately. I also found it pretty easy with stock squads and first transfer window disabled, 6 pts clear by new years right now. Stick with the 442, wing play is very strong again this year. I put Pereira at left wing and he's got 2 goals 8 assists in 13 appearances. I'm off loading a third of my squad in the jan window before their contracts expire, as this years United is pretty interesting in that nearly half the teams contracts are expiring. 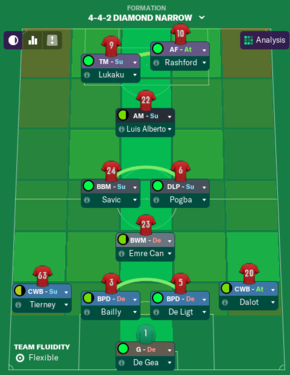 So lets see what happens as I ease Gomes, Chong, and Ro-Shaun into the first team for the second half of the season to replace Jones, Smalling, Fellaini, Herrera, and probably Lingard (60m to Arsenal!). How much and who did you sell them to? Yeah, that's too many changes. First season, it's generally best to get rid of maybe 2, or 3. Besides, generally, you can get better prices after a season (or even half a season). And the squad is decent enough to warrant it, mind. Case in example, this is the deal I got for Fellaini, half a season, and barely playing a couple of games. Thats a nice price for him, like 42m in GBP?? I got 28m from a Chinese team end of Jan so I snapped there hands off, I also got 20m for Darmian from Barca but I feel I could have got more there but it was last day of the transfer window. 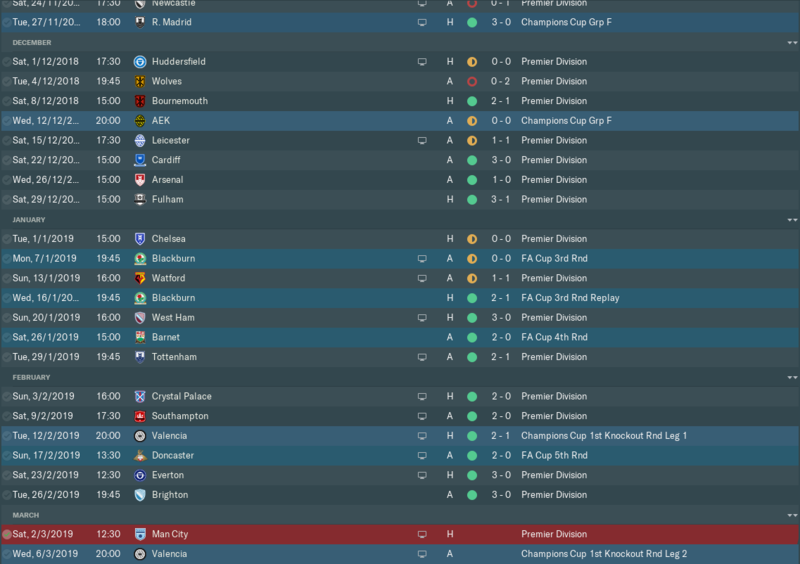 Coming to the tailend of my first season now, managed to go unbeaten all the way through Christmas, just losing to Wolves 2-0 away at the very start of December, 10 men behind the ball all game and scored TWO freekicks! 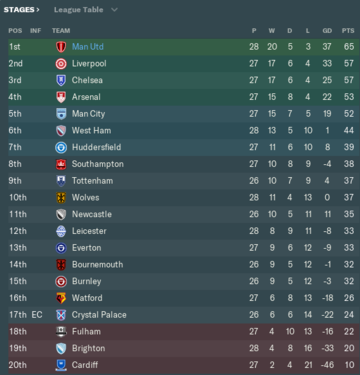 Should have the League wrapped up, but never say never, have City at Home next game, if I win that I should be good, hardest game after that is Arsenal at home last game of the season. 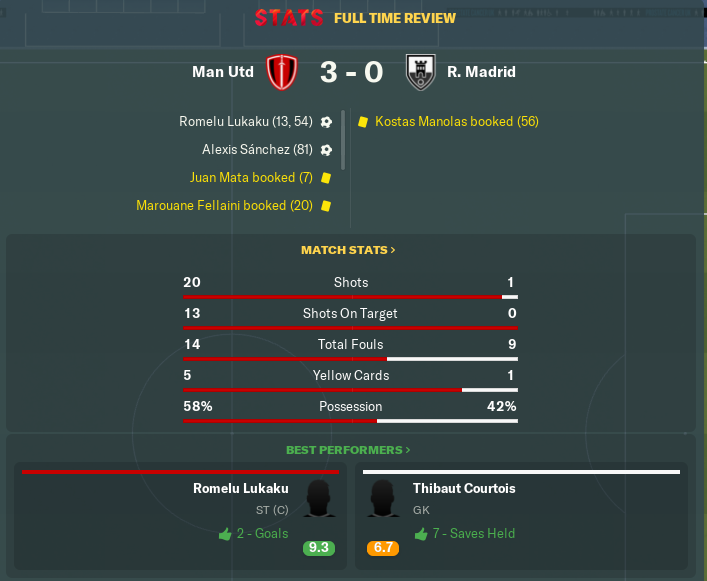 Some nice results since my last update, Madrid 3-0 at home, they never had a shot on target. Beat Arsenal 1-0 away which was huge, I did scrape that win though they we're unlucky not to score. Dissapointing 0-0 draw with Chelsea at home but managed to grab a 94th minute winner against Spurs away for 2-1! I have a second leg with Valencia in the UCL which could be a big problem, I lost both my left backs to Injury in the first leg and had Bailly sent off for a two foot tackle. Looking at the results we're not scoring much but we're also not conceding many, which I am happy with to be honest. My strongest team I can field right now, I just splashed the cash on Savic in Jan, 90m he cost me but he will be the heart of my Midfield for the next 5 years at least. I will just say now, KEEP VALENCIA. The guy is an absolute beast up and down the wings. Hes getting MoM almost every week. His work rate is insane. Just got this guy through my youth intake, french left back! 15 years old! From the last two seasons, I tend to keep Lingard. Sure, you can get a huge amount for him, but he's homegrown, a local lad, and a very nifty and useful utility player to have. Also, don't knock de Ligt off, he can easily slot into the first in the first season, he's a beast. But other than that, Varane, yes. Honestly though, Smalling and Bailly are actually good enough, atleast for the first season. Pretty solid. Jones, not so much. His concentration is shot in this update. IIRC, he was much better the previous one. Rojo again, is solid. In case anyone is planning on strengthening elsewhere (RW? ), these can do a good enough job. I didn't mention Lindelof here, because for me, he is a beastly RB. I just don't like Smalling in real life, so I never play him on FM. I think hes incredibly over rated in real life, but thats just my opinion. Well, it depends. He is very limited IRL, but what he does, he actually does it pretty decently. Of course, he has the occasional howler (frequently, too), which is why you'll never classify him as a top, top CB. But he gets the job done. Which is actually mirrored in FM. I used Lingard as a CM-Su (very similar to Box-to-Box) in a 433 in my FM18 save and he was great. His plays one-twos trait seems perfect for a support role in midfield - he was in a three with Matic / Tuanzebe as A-De and Pogba as CM-At. Just make sure he's not in the mixer on set pieces as he's not a big guy. Oh, and don't expect a nice green circle at any point - those indicators were telling me he should be awful yet the amount of records we broke suggested otherwise. Also, Demetri Mitchell looks rather good for a backup option to Shaw. In all my FM saves till date, I've flogged him off. Anyone started playing him in the second season yet? If he can perform, that means that money can be saved, that would otherwise go to a new LB. 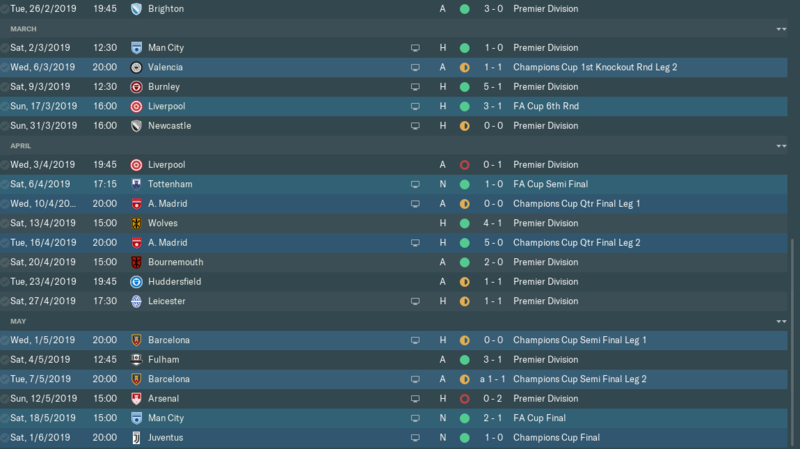 So I finished the season winning the treble, I was expecting the win the league but not the UCL. 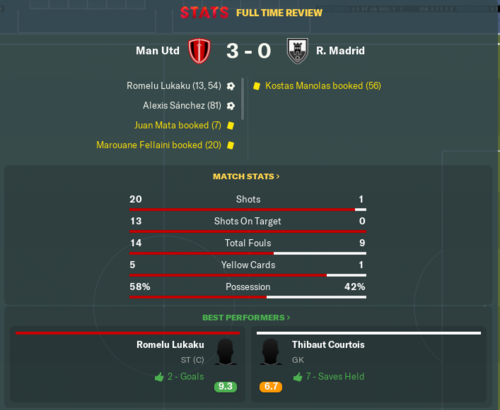 Got very lucky to beat Barca in the semis, drawing the first leg at OT 0-0 and then I scored the away goal in a 1-1 draw away and I have no idea how Juve didn't score against me in the final, they 100% deserved a goal at least. Ronaldo going close multiple times. I have just started my pre season friendlys in season 2. 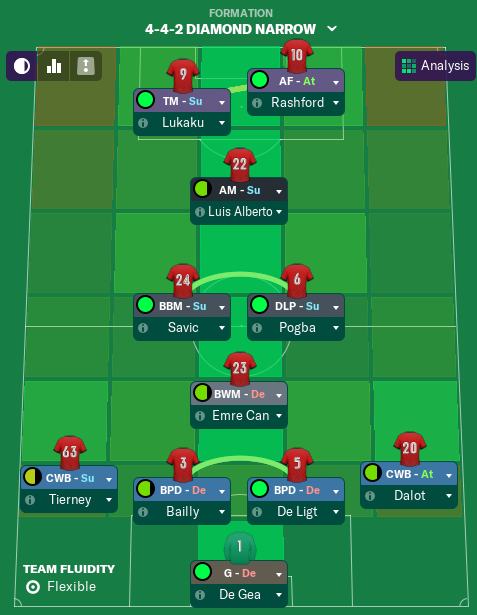 I am finding it hard to get rid of anyone, i've tried to flog Shaw (Way to injury prone), Mata (Not impressed), Sanchez (I think its his high wages), only person I was able to sell was Martial and he went to Bayern. Anyone got far enough to see how Mason Greenwood develops? Seems to have a good eye for Goal, loaned in out to Shrewsbury at the end of seaosn 1 and he bagged 9 goals in 15 games and now hes at Hull season 2 and has 4 goals in 5 games in the Championship at 17 years of age. 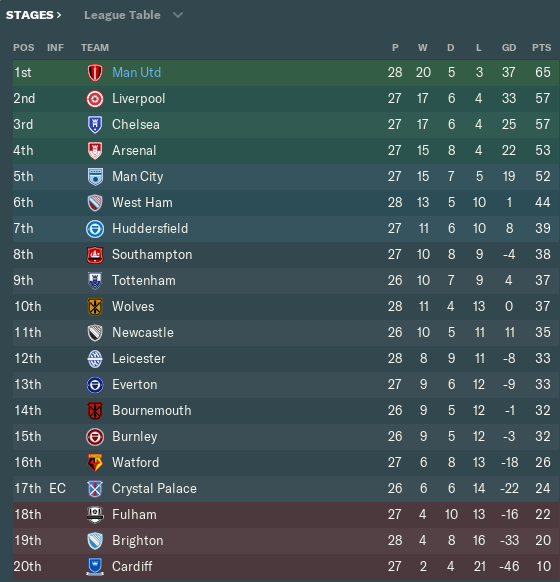 As per usual It's a Man United save for me,played one season with the Beta and finished 4th, about 15 pts behind winners Liverpool. But have now started what is always my one and only save every FM. I wanted to sort out the fullback area so I bought in Tierney and Kevin Mbabu from Young Boys. My big signing was Fekir but after 2 games tore his cruciate and is out for the season. The only major departure was Jesse for about £35m. The results have been fantastic to say the least,plenty of goals coming from open play although I still feel that strikers are missing way to many 1v1 and even though we are set to low crosses most crosses that come in are anything but. My shining light so far is Paul Pogba,playing in the RPM position he is amazing. I'll update at the end of the January window,I'm happy with the squad but have declared interest in Milenkovic Savic and if i'm given any funds which I think I will as my wage bill is about £300k a week less than expected then I'll try and get him.Lukaku is doing ok with 8 in 14 but I'm looking for something different in that position but I'm happy to wait until the summer for that to happen. De Light and Lindelöf are doing well together and I have Bailly and Smalling as cover so no need to look to improve there. For the first time ever I've kept Fellaini and to be fair as a BBM he isn't to bad but that is just for this season as I will be looking to offload him, Fred and Ander in the summer,I just don't think they are good enough to be honest. Martial,Sanchez and Rashford are fighting it out for the AML slot and filling in for Lukaku when he gets injured. Mata has made the AMR slot his own albeit as a result of the Fekir injury and I am giving game time to Chong and Greenwood in games when we are a couple of goals up with 20 minutes left in games. All in all we're looking good but the squad needs sorting out over the next 3/4 transfer windows. Have you thought about Dier for the DM role? Might be available in summer 2019. I have just started a new United save. Sold Jones and Darmain. Signed Tierney, De Ligt. Also thinking about spending big on Milan Skriniar. 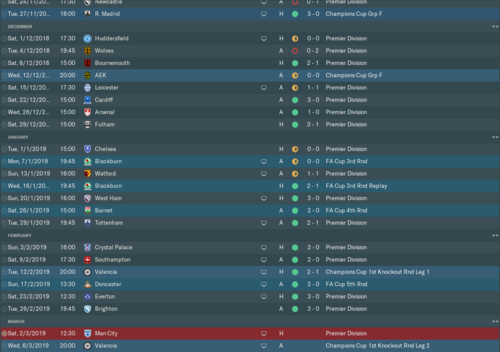 I like Dier,also looking at Ruben Neves,Wolves are 2nd bottom in my save so I might be able to get him on the relative cheap if they get relegated,also looking at Tanguy Ndombele from Lyon.You not happy with Lindelöf,Smalling and Bailly?I feel they are more than good enough in FM. I like Neves as well, he was my DLP for any fantastic Roma side in FM18. Lindelof is ok as a ball playing defender, though not as good as De Ligt will be. Smalling lacks pace and intelligence, his only strength is heading. Plus, he only likes to play on the right, which is where De Ligt will be. Smalling can stay for a season as back up, will then be replaced in the squad by Axel Tunazabe. I’m playing something very similar but not getting many goals from wide areas. Can you post goal stats for your squad currently? I am only on the demo, but I started Greenwood right from the start, scored on his debut and now building a nice partnership up top with Lukaku. So far he has started 8 and made 6 sub appearances, scored 5 and has 3 assists. 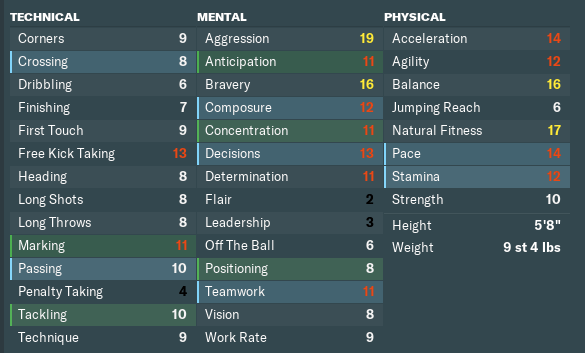 Uduokhai (CB) from Wolfsburg 23.5m rising to 76... But the clauses are 34m after 50 league goals(lol) and 19m after 50 league games - I didn't think I was going to carry the save on haha. Top after 11 games winning all of them, only lost 1 game so far against Real Madrid and drew against Galatasaray away as had so many injuries. Won everything else. Anybody had a good look at Harvey Neville? He's in the u18s, Phil Neville's son. I deleted my save so can't have a close look. I have him in my first team squad for the training but available for the U23's for 90 mins, Started him against Standard in the Champions League due to injuries and he scored! Next game I bring him on at 1-1 away to Watford and he bagged the winner in the 89th minute! Really not a fan of Lukaku, he will be off in January so I have been starting Rashford up top and he has 7 goals and 3 assists in 9 starts. 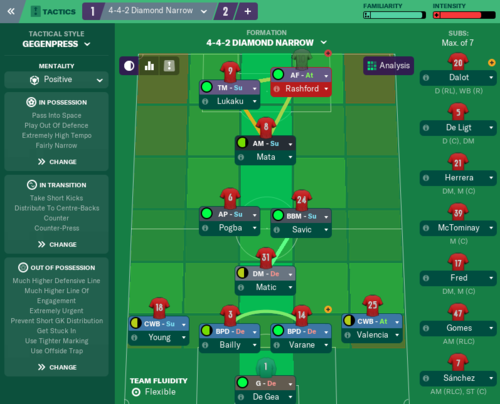 I have Mason Greenwood and Chong in the first team squad for training and they are both available for the U23s, Greenwood has 2 in 2! Rubbish stats .14 pace,12 crossing,10 finishing and 10 first touch.Not much else above 10.